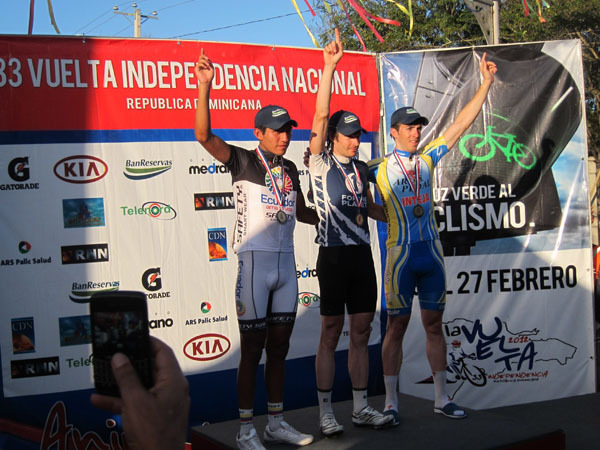 Results from today's 7th stage of the Vuelta Independencia Nacional in the Dominican Republic. Today's stage was won by Bruno Langlois (1% for the Planet), who now moves to 8th in the overall. 9 Robigzon Oyola (Col) EPM-UNE all s.t. 11 Coulton Hartich (USA) Firefighters R.T.
20 Camilo Castiblanco (Col) EPM-UNE all s.t. 23 Christian Parrett (USA) Firefighters R.T.
27 Jorge Gallegos (Ecu) Team Ecuador all s.t. 30 Mickael Clarico (Fra) A.S.C. Vetiver s.t. 35 Jorge Luis Martinez (Dom) La Vega-Com.Nal.Ener both s.t. 42 Calos Lorenzo (Dom) San Cristobal-V.Alt. 52 Leo Frayre (USA) Firefighters R.T.
54 Victor Ayala (Mex) Firefighters R.T.
60 Manuel Sanchez (Dom) San Cristobal-V.Alt. 65 Shane Braley (USA) Firefighters R.T. all s.t. 77 Silverio Mejia (Dom) Team Romana all s.t. 81 Jonathan Reinoso (Dom) San Cristobal-V.Alt. both s.t. DNF Hector Santos (Dom) San Cristobal-V.Alt. DNF Deivi Capellan (Dom) San Cristobal-V.Alt.